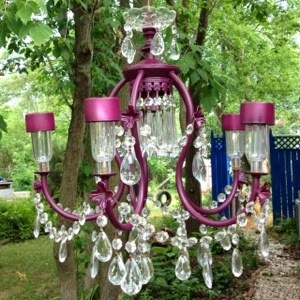 In August of last year I garage saled this chandy for $5. The guy assured me it worked but I was mostly interested in how light weight it was. I'd just blogged about how awesome solar chandys were the week before. 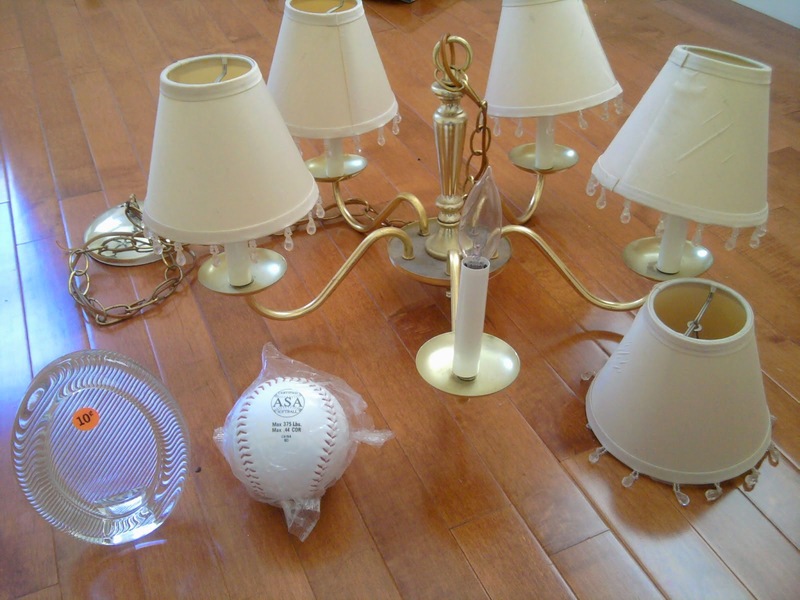 So I bought it, the bulbs eventually went in our basement chandy and the light covers were donated to the little thrift store. We bought our new house in September and I had a terribly misguided idea where we would move, unpack and a week later I would be back to crafting and being creative. I am STILL unpacking and ten months later am finally converting this thing. Here it is in its stripped down "glory." First thing was prying the ceiling cover off. All it took was unlinking the top link but it must have been forged in Hades because it took me about ten minutes to get that thing off. The rest was easy. The plastic covers slide off without a bulb. Underneath were the power and ground cable and a cardboard ring at the top. At the bottom was this little nubbin which easily unscrewed. Inside were the real guts. I wire snipped away the wire going to the ceiling, the sockets and the base. I left the sockets intact so they will hold the new candle holders steady. Then came the cleaning. Do you see the "cups" at the base of where the candles would be? See how matted gold it looks? Its supposed to shiny gold like the base next to it. No judgements, I forget light fixtures can even be cleaned. Humidity was very high and it was taking so long to dry in full sun. I weeded, moved some plants around and even deadheaded an entire rose bush and it was still wet! Plus I was sweating and impatient. So I hung it from the hook the wicker basket used to hang out on (and which will be its permanent home) and sprayed the top and sides. I did some of the chain but not all. That's going to be a "lay it on cardboard and spray" project. See my beloved hammock in the background? Love. What I didn't love was the silver on green. It made them look like solar lights stuck on a chandelier. Too obvious! So I painted those green too. The caps are fuschia too! I have some of those fake crystal strands (don't ask) but that would be overkill. Our chandy is utalitarian and sedate. Anyway the top portion of the lights had been chilling in the sun all day. Last week I set up the outdoor solar lights after sunset and had to wait for the NEXT DAY to get the full effect. I don't have time for that! The metal slid off the plastic electronics components easily with a bit of slow, steady pressure. Black on its own looks nice too, right? PAINT ALL THE THINGS GREEN!!! Don't worry about the gaps, I did this on the grass too. Maybe the neighbors will think aliens did it. I need to add the little spigot and figure out how to hang it from the bottom but otherwise done. Check out my hammock with pillow and iPad in the background - its Past Anny's Dream Come True! Sans tripod cause that's how I roll - also because its on the second floor and I am lazy. OHMYGOSH! I LOVE THIS! I haven't seen this on Pinterest, but it's amazing!!!!!!!!! !